Oxford has been an important town since the Saxon period when there was a Castle here and a Mint. The town was fortified, in the 14th century, and a large stone wall was built surrounding it- fragments of the wall remain today. There were four main and two subsidiary gates all of which have since been demolished. Of the four main gates the south gate was demolished in the 16th century when Cardinal Wolsey built Cardinal College, the West gate in about 1600, and the North and East Gate in 1772. 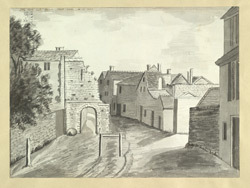 The two smaller gates were known as Smythegate and Littlegate, and it is the later which can be seen in this print.